Day trading is a fast game with many factors. It is best to keep your trading method simple for effective trading. 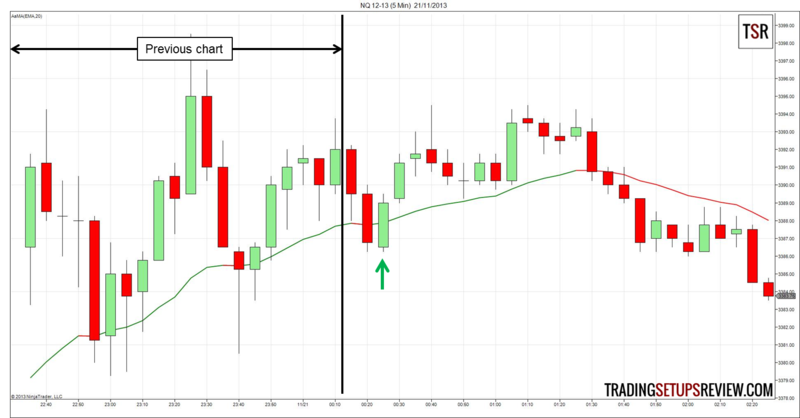 For traders looking for simplicity, using only a 20-period moving average to day trade is a great option. 20 is not a magical number or the best kept secret in day trading. Basically, any intermediate period is useful for day trading. A long 200-period moving average lags too much and does not help day traders. A short 3-period moving average is almost like price itself and is mostly redundant. As for the choice of moving average type, we are using exponential. But a simple moving average will work fine too. The key is consistency and do not keep changing the period or type of your moving average. Determining the price action context, whether the market is trending or in a range, requires discretion and experience. A moving average can help to clarify the price action. These are some questions to help you clarify the context using a moving average. Are prices above or below the moving average now? How did prices get there? Have prices been overlapping with the moving average? What is the slope of the moving average? Has the slope been changing often? The answers to these questions cannot be interpreted in isolation. We need to integrate them to form an analysis. The is an example with a 5-minute chart of NQ futures. It shows the first 20 bars of the session. Let’s try to answer the guiding questions above. Price is now above the moving average. It got there after a bounce off the moving average. However, it has not exceeded the last swing high. 7 out of the past 20 bars overlapped with the moving average. The bars that overlapped mainly had long bottom tails. The bars that did not overlap the moving average were all above it. The slope of the moving average is positive but not overly steep. The slope of the moving average turned down momentarily at two instances. Prices were mostly above the moving average and bounced from the moving average. These signs show that the day has been bullish. However, the slope of the moving average is not steep and had turned negative at two instances. So, despite the bullishness, the market is not in a strong trend. What are the implications of our analysis on our day trading? We should only take long trades until there are bearish signs. But due to the lack of a strong trend, we should aim for nearer targets. After analyzing the market context, we have to look for trade setups and the moving average is again a useful tool. In a bull trend, buy when prices retrace to the 20-period moving average. In a bear trend, sell when prices pullback up to the 20-period moving average. This chart shows the price action after our price context analysis. The two-bar reversal at the moving average was a buy signal. As the context was bullish, we took the trade. However, as implied by our context analysis, we should not press for large gains. We can also use candlestick patterns with the moving average to pinpoint entries. Although not applicable in the same example, the moving average is also a natural tool for placing trailing stops. The moving average follows the price trend but lags behind it. Hence, a trailing stop based on a moving average locks in profit and at the same time gives enough room for whipsaw action. Day trading with a moving average is a simple approach to capturing intra-day trends. 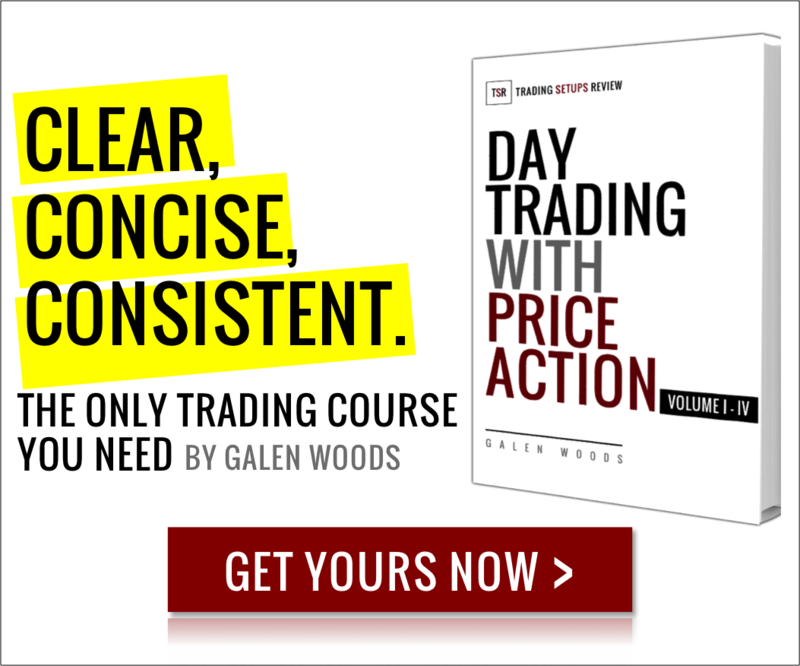 It is a valuable tool for traders learning price action. This because a moving average plots on the price chart itself and interacts with price itself. When we look at a moving average, we have to look at price as well. Open a chart now and put on a 20-period moving average. If you practice enough, a 20-period moving average is possibly the only indicator you need. I find the information on this website extremely useful. However, as a novice I get confused by all the possible set ups and don’t know on which I should focus. I trade the dax, mainly in 5 and 15 minutes intraday but sometimes also in 1h and day on swing. This is mainly done on S and R levels. If you should recomment 4-5 setups for my trading, what would you propose to focus on? As a novice, you should focus on 1 setup at a time. Looking for 4 to 5 setups might dilute your attention. This article gives an overview of the type of strategy that’s good for beginners. If you prefer a structured approach to learning price action trading, take a look at my course as well. Feel free to email me if you have any more questions. 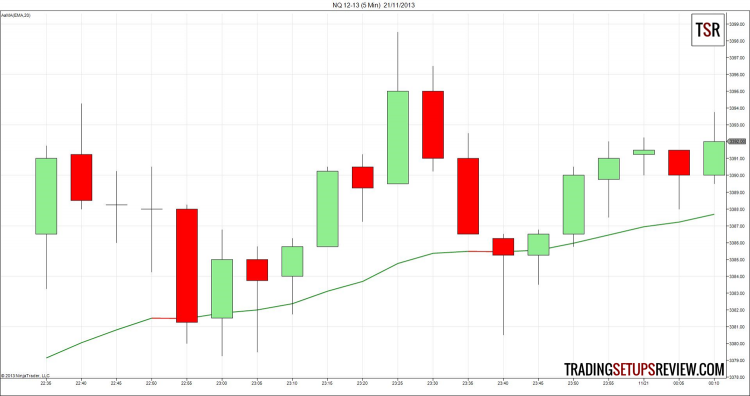 Nice work, but using a 20 EMA is this best for day trading on M5 or M15 or should you ever use M1. Do u use EMA set up on opening price, closing price or something different. Glad to help! M1 can be used, but that depends on the individual market and your trading style. You can check out this article for more on choosing time frames. I used the EMA of closing prices here, but typical and median prices can be used too. Thanks for that. Yes one EMA seems best have tried using 2 or 3 which makes things more complex. I am trading currencies such as EURUSD, GBPUSD etc, trying to day trade and use M5 and M15 but M1 to close. would you agree with this strategy? Multiple time frames are like multiple indicators. As long as you know what value each additional time frame is adding to your decision process, a multiple time frame strategy with a single EMA sounds solid.